Random spins (wheel, Mickey and Minnie). 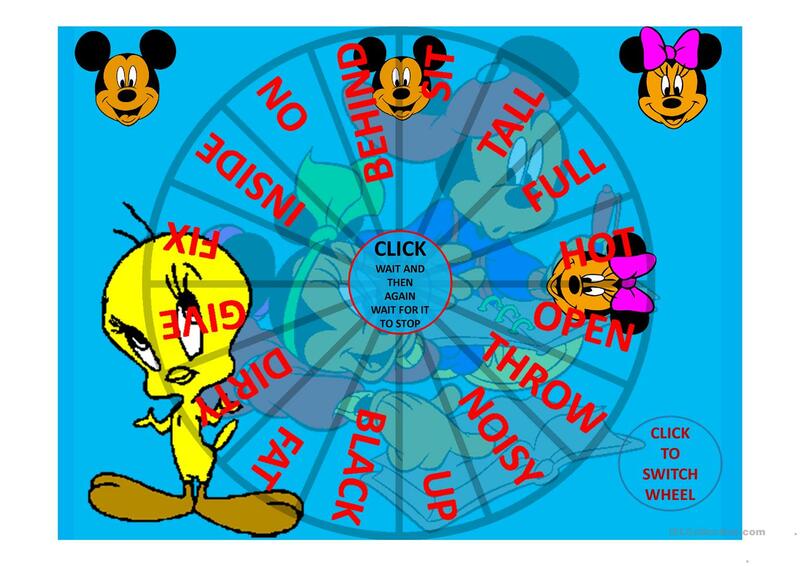 Click on the center of the wheel, wait and then click again. Wait for it to stop and Mickey (team 1) and Minnie (team 2) will come to a stop on an opposite or two opposites. Each team must give the opposite that their mascot lands on. If both land on the same opposite the team that answers correctly gets the points (5 point per correct opposite). Click on the numbers to change the score. This printable, downloadable handout is recommended for high school students, elementary school students and kindergartners and nursery school students at Pre-intermediate (A2) and Intermediate (B1) level. It is valuable for revising Adjectives in English.